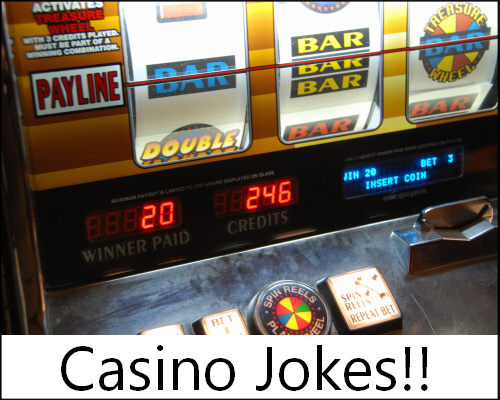 Following on from our recent posts about the fun of having a crack at winning big playing casino games, bingo and poker online we have a few classic one liners for you. They cover all topics such as poker, slots and other casino games like blackjack. To complement this blog post here is a cheesy stock image of the topic :p We hope you like it. Read on below for the goodies. What is the difference between praying in a church and praying in a casino? In a casino, you really do mean it. How do you get a sweet little old lady to shout the word f**k? Get another sweet little old lady to yell the word bingo! Why don’t they allow gambling in the Africa continent? Because of all the cheetahs. How is a casino like a woman? Liquor in the front, poker in the back! Where’s the only place in the world you are guaranteed to get screwed? Vegas baby! What is the difference between a professional poker player and a dog? In about 10 years, the dog will quit whining. I walked around the casino last night with a pocket full of chips. Even now I am still trying to get the smell of vinegar out of my trousers. How do you leave Vegas with 1 millions dollars? Go there with 2 millions. Credit for the image at the top of the post goes to SXC.hu and sgman. Used under royalty free license.